This week I researched these names of Tomasita Montoya, Reyectia Trujillo, Lela and Van Gutierrez, Petra Tafoya, and Dora Gato to confirm if these individuals were potters. Tomasita Montoya (1899-1978) was a San Juan Potter. 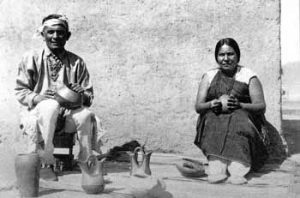 She was one of the original seven potters in the 1930’s “San Juan Revival”. Especially known for her incised polychrome redware jars, bowls and vases. 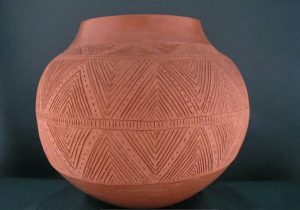 Decoration on these vessels included clouds, kival steps, triangular fret and fine line hatching. On occasion she utilized micaceous clay, adding some textured geometric elements. Tomasita worked along side her daughters; Dominguita Sisneros and Rosita de Herrera who are also famous potters. Reyecita A Trujillo was from the San Juan Pueblo. and was one of the seven original potters who participated in the San Juan pottery revival. She worked with her husband Juan Hilario Trujillo who would carve designs on her pots. Known for her redware polychrome plates, carved blackware and micaceous jars. Lela and Van Gutierrez were potters from Santa Clara, they tested many ideas in pottery making, developing a decorative scheme that featured earth colors on a matte background. Using bold curvilinear designs on neutral tan or beige became the base for a new Santa Clara style. Lela and Van were true innovators and specialized in pictorial designs in using a variety of hues and colors not normally associated with pueblo pottery. Lela and her son Luther Gutierrez (1911-1987) collaborated on pottery following the death of Van in 1956. Luther continued in his father’s style. This entry was posted in Lucie's Journey by Danielle Persinger. Bookmark the permalink.